This example imports an RGB (red, green, and blue) image from the IDL distribution into a Java class. 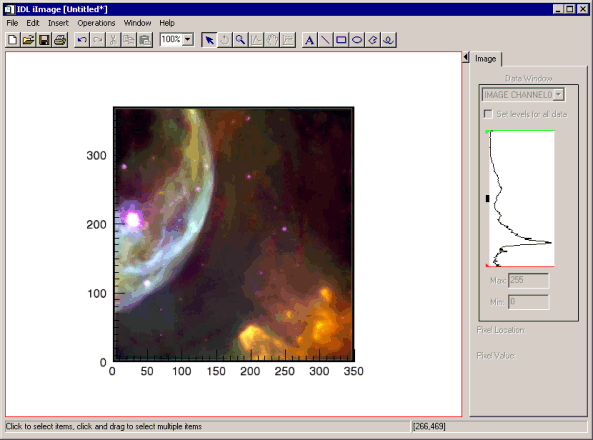 The image is in the glowing_gas.jpg file, which is in the examples/data directory of the IDL distribution. The Java class also displays the image in a Java Swing user-interface. Then, the image is accessed into IDL and displayed with the new iImage tool. Note: The Java and IDL code for this example is provided in the resource/bridges/import/java/examples directory, but the Java code has not been built as part of the jbexamples.jar file. Note: This example uses functionality only available in Java 1.6 and later. Note: Due to a Java bug, this example (and any other example using Swing on AWT) will not work on Linux platforms. Note: The above text is for the FrameTest class that accesses the glowing_gas.jpg file in the examples/data directory of a default installation of IDL on a Windows system. The file’s location is specified as c:\\ITT\\IDL70\\EXAMPLES\\DATA in the above text. 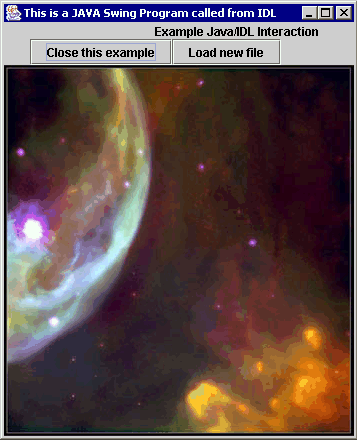 If the glowing_gas.jpg file is not in the same location on system, edit the text to change the location of this file to match your system. Compile these classes in Java. Then either update the jbexamples.jar file in the resource/bridges/import/java directory with the new compiled class, place the resulting compiled classes in your Java class path, or edit the JVM Classpath setting in the IDL-Java bridge configuration file to specify the location (path) of these compiled classes. See Location of the Bridge Configuration File for more information. ; Create a Swing Java object and have it load image data into IDL. ; Create the Java object first. ; Get the image from the Java object. ; Interactively display the image. After compiling the above routine, you can run it in IDL. This routine produces the following Java Swing application. Then, the routine produces the following iImage tool. Note: After IDL starts the Java Swing application, the two displays are independent of each other. If a new image is loaded into the Java application, the IDL iImage tool is not updated. If the iImage tool modifies the existing image or opens a new image, the Java Swing application is not updated.